Instructions: After opening either of these BFN links, click an issue to view it. To close an issue, click the little blue "x" near the upper left corner of your screen. If you have a Bradt book that you no longer need, consider donating it to a cousin. Just leave a message and your e-mail address in our Guestbook and we'll get the word out. Thanks. The most complete source of information about the Bradt family is Cynthia Brott Biasca's 1990 book Descendants of Albert and Arent Andriessen Bradt, in combination with the updating supplements. Cynthia deserves our praise for the years of research she (with the assistance and support of her family and friends) dedicated to bringing together the vast amount of information in her two books, and ancestor charts. Descendants of Albert and Arent Andriessen Bradt is available from the Higginson Book Company: HIGGINSON BOOKS WEBSITE. published by Cynthia in 1993, contains additional lines and identifies Bradts that were previously unknown. It does not replace her original Bradt Book . Like the other supplements, it is used along with the original book. It is also available from Higginson Book Company. The Second, Third, and Fourth Supplements to the Bradt Book, Including Vanderzee were written by Laurie Grimes. (Laurie also typed part of the orignal Bradt Book.) These books also include updates, additions, and new lines. Some previously unknown lines are now resolved. These books are available directly from Laurie. The following shipping costs are for U.S. destinations. To get shipping charges to Canada, write or e-mail Laurie at the address below. The Second Supplement to the Bradt Book (including VanDerzee) contains about 6000 names, is 8/12 by 11, hardcover and 241 pages in length. It is available at cost for $20.00 plus $5.00 shipping in the US. The Third Supplement is hard cover with 164 pages, with over 1000 individual Bradt, Brott, Bratt, etc. descendants. The cost is $15.00 plus $4.25 postage, for a total of $19.25, if mailed in the US. The Fourth Supplement is a spiral-bound book of 65 pages plus index. The cost is $10 plus shipping, which is generally about $5. If you purchase all three of these supplements at the same time, the cost is $35 plus $7 for postage. Get 'em while they last! Make checks payble to the Bradt Family Society. These books were published at the request of the Bradt Family Society. A Norwegian Family in Colonial America by Peter Christoph. This is a short handbook which documents the eventful lives of the first two generations of the Bradt Family in North America. It can be borrowed by inter-library loan or purchased from Higginson Books. Thanks, Peter. Our thanks to Joan Bradt Wood for her book, JOURNEY TO A NEW LAND, The Bradt Family in History. This is a social history of the Bradts beginning with our origins in Norway, Holland, New Netherland, and New York and continuing through the events of the American Revolution. 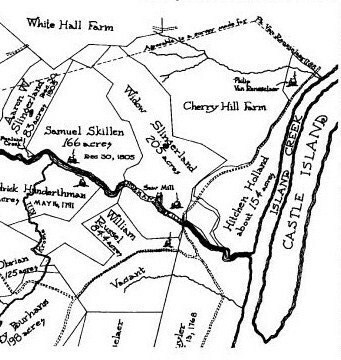 201 - 1569 Everall St.
*The evidence is convincing that the Bratt sawmill was located on Widow Slingerland's 205 acres in the center of this map, about where the sawmill is depicted above. This map shows the property boundaries 100 years after the time of Albert.